StudioLive AR12 USB 14-channel hybrid mixers make it simple to mix and record shows, productions, rehearsals, podcasts and more. It is lightweight, versatile, and loaded with analog connections and digital tools, yet it is easy to learn and use. Just because you don't need a lot of channels doesn't mean you don't need them all to sound great. PreSonus famous Class A preamps are the envy of the industry, and the AR8 three-band EQ is famously sweet and musical. Plus, the StudioLive AR12 USB features an internal stereo effects processor with 16 presets, including room, hall, and plate reverbs, chorus and delay effects. All respond beautifully to the 60 mm channel faders. There are two important aspects of a mixer: what it does and how it sounds, and this mixer sounds good. With the AR12 you can create multitrack recordings and fly in backing tracks with a 24-bit, 96 kHz, USB 2.0 digital audio interface. You can record and playback in stereo with the integrated SDTM digital recorder. You can stream program music wirelessly, using onboard Bluetooth. With the AR12, you can. StudioLive AR12 USB mixers feature connections and controls needed to mix and record live, in the studio, and in rehearsal. Each of the four mono channels and four stereo channels includes level control, a mic input, three-band EQ and more. Apart from the main outputs, you get a monitor mix output with a bus for monitoring. You also get control-room outputs with level control to feed studio monitors. The Super Channel allows you to connect four stereo sources at once so you can use the mixer with your high-tech devices. Plug a media player into the Super Channel’s unbalanced RCA and 1/8-inch stereo inputs, play stereo audio from the onboard SDTM recorder or from your USB-connected Mac or Windows PC. Use onboard Bluetooth 4.1 to pair your phone to your AR12 and instantly have wireless access to your music library for break music or backing tracks. StudioLive AR mixers offer two ways to record. 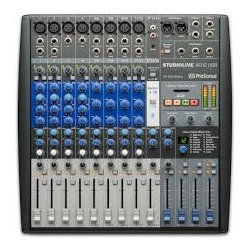 Connect a StudioLive AR12 USB mixer to your computer via USB 2.0 and you have an 8x4 multi-track digital recorder ready to capture all input channels plus the main mix to a Mac or Windows PC with 24-bit/96 kHz quality. Or, an onboard stereo SD recorder lets you record the main mix. PreSonus StudioLive AR mixers are tightly integrated with state-of-the-art recording software to help you achieve your creative vision. Record with PreSonus Capture live-recording software, then edit in the Studio One Artist DAW; both are included. The StudioLive AR12 USB is an, all-in-one solution for audio mixing and recording. With a wide variety of connections, two ways to record, and a simple, elegant mixing surface, it will quickly become the heart of your live and studio sound systems. Both new and existing registered owners of any currently available PreSonus audio interface or mixer are receiving a free bonus: the Studio Magic Plug-in Suite for Mac and Windows. The software bundle includes seven popular plug-ins in VST, AU, and AAX formats. Currently eligible interfaces and mixers include the PreSonus AudioBox USB, AudioBox i-series, and Studio-series interfaces and StudioLive Series III, StudioLive AR USB, and StudioLive RML-series mixers. The software will be automatically added to registered users’ online MyPreSonus accounts and can be downloaded at any timeâ€”even if they bought the eligible PreSonus interface or mixer years ago. The suite includes: SPL Attacker, Maag Audio EQ2, Lexicon MPX-i Reverb, Eventide H910, Eventide 2016 Stereo Room, Brainworx bx Opto Compressor and Arturia's Analog Lab Lite.